Nandini : I’m the good & only daughter to my parents, mother of two cute kids and wife of a loving husband. I completed Bachelors degree in Mathematics. Nandini : Some of my interests are health foods, reading novels, snapping some shots of surroundings (food also, of course) and listening to music. Nandini : I mainly focus on Indian cuisine. However, I adopt dishes of other cuisines. Nithu's Kitchen : We have always appreciated your lovely clicks. How you got this interest in photography. Nandini : Thanks. I have always admired photos of nature while surfing the net. I’ve always taken shots of the nearby environment. Initially when I started blogging, I used to shoot ordinary flash pictures with my camera. But after a while, I felt insatiable with my snapshots. Then I experimented taking photos without flash and the results were, of course, quite impeccable. Nithu's Kitchen : What made you to start a food blog? Nandini : To be exact, my husband suggested me to start one. Nithu's Kitchen : Have you encountered with any interesting kitchen mishap? If you have a story please do share with us. Nandini : Hmm. Yes, I did. When I was in my mom’s house during the holidays, I was making seedai for the first time. My parents were outing at that time. I was a bit nervous in deep-frying stuff. I had rolled the little balls out of the dough and put them in oil for deep-frying. The seedais burst, jumped out of the kadai and I ran out of the kitchen screaming for my life. When the mishap got over, I tip-toed to the kitchen very hesitatingly with my husband armed with stainless steel lids. Instead of the seedais, the kitchen got fried and sloppy. It was a very indelible experience. Nithu's Kitchen : What dish do you have today to share? Why did you select this particular dish today? Nandini : I’m sharing pumpkin pulao today. 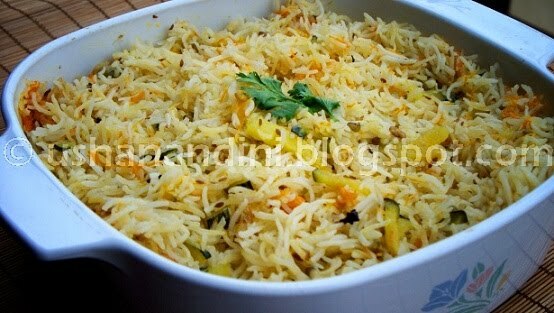 Pulao is one of our favourites in my house. This pulao is a microwave version. It was one of the biggest hits in our house. All of us had the pulao finished for lunch. I must confess that my face was beaming with satisfaction. Sprouted green gram - 2 tsp. Sprouted fenugreek seeds - 1 tsp. Wash basmati rice for 4-5 times and soak in water for 45 minutes. Grind green chilies and ginger and keep aside. Add oil, onions, cumin seeds. cardamom, cloves and cinnamon in a microwave-safe dish. Microwave high for 4 minutes by stirring in between. When the onions change color add ground chilies and ginger. Microwave high for a minute. Add pumpkins, sprouted fenugreek, carrot and green grams and microwave high for 2 minutes and stir. Discard the water and add the rice and salt. Add 2 1/4 cups of water and close the dish with a microwave-safe lid partially with a small gap on one side. Microwave high for 10 minutes. Stir gently and microwave low for 15-19 minutes or until the rice is cooked. After 3 minutes, mix so gently that the fragile rice shouldn't be broken. Enjoy with your favorite raita. Nithu's Kitchen: Thanks Nandini for the unique pulao recipe. We had great time talking to you. Nandini : Thanks Nithu. It was a pleasure sharing my experience with you. Nice to know about Nandini. Thanks for the recipe. புலாவ் மிக அருமையாக இருக்கு,அறிமுகத்திற்க்கு நன்றி நிது!! nice to know abt u nandini.. pulao looks innovative and interesting! Love Nandini's space, glad to know more about her through this interview..
Nice to know about Nandini thru you! Hi Nandini, Great recipe! Good to know more about you! Nithu, you are da bomb!